¡ïThe folding design is unique, push the button for a second. When not in use, you can fold away your adult scooter for easy storage. 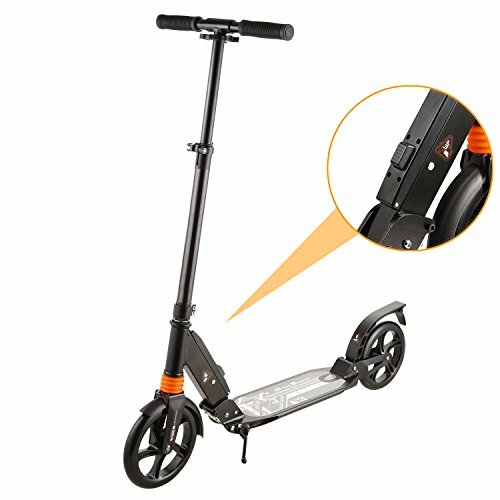 ¡ïThis sleek Scooter features 200mm PU wheels designed to create a smooth glide and comfortable ride. ¡ïThe deck design is unique, with it positioned lower than the axle, providing greater stability and reducing the need to lean. Additionally, the wider deck provides a more secure footing. ¡ïWith in-built suspension and soft handle grips, this high-end, multi-faceted scooter has been purpose built for bigger, heavier riders with arobust frame and sturdy wheels for stability. ¡ïWith a strong, aluminium frame and incredible 200mm wheels, the Scooter is robust and reliable for your best scooting experience yet.